Not to be confused with The Heartbreakers. Petty's early bands included the Sundowners, the Epics, and Mudcrutch. In 1974, Mudcrutch signed with Shelter Records and re-located to Los Angeles, California. They released one single, "Depot Street," in 1975, which failed to chart; the group consequently disbanded. 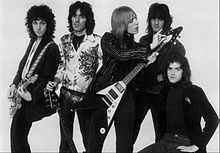 In 1976, Petty, with himself as lead vocalist and guitarist, formed "Tom Petty and the Heartbreakers" with Mike Campbell (lead guitarist), Ron Blair (bass), Stan Lynch (drums), and Benmont Tench (keyboards). The Heartbreakers began their recording career with a self-titled album, released through the Shelter label. Initially, the Heartbreakers did not gain much traction in the U.S., although they achieved success in the U.K. playing "Anything That's Rock 'n' Roll" on Top of the Pops. Early singles included "Breakdown" and "American Girl". Recalling the band's first gig in the UK in 1976, Petty states, "The audience just jumped up and charged the stage and were boogieing their brains out. It was such a rush. Wow, we had never seen anything like that, man." "Breakdown" was re-released in the U.S. and became a Top 40 hit in 1978, after word filtered back of the band's massive success in the UK, and perhaps more importantly after it featured on the extremely popular soundtrack to the 1978 film, FM. "American Girl" was covered in 1977 by Roger McGuinn on his "Thunderbyrd" LP. Tom Petty and the Heartbreakers' second album, You're Gonna Get It! (1978), was their first gold record, and featured the singles "I Need to Know" and "Listen To Her Heart". In 1979, the band was dragged into a legal dispute when ABC Records, Shelter's distributor, was sold to MCA Records. Petty refused to be transferred to another record label and held fast to his principles, which led to his filing for bankruptcy as a tactic against MCA. In 1979, after their legal dispute was settled, the Heartbreakers released their third album Damn the Torpedoes through MCA's Backstreet label. The album rapidly went platinum. It included "Don't Do Me Like That" (#10 U.S., the group's first Top Ten single) and "Refugee" (#15 U.S.), their U.S. breakthrough singles. On their fifth album, Long After Dark (1982), bass player Ron Blair was replaced by Howie Epstein (formerly of Del Shannon's backing band), giving the Heartbreakers their line-up until 1991. Long After Dark features the hits "You Got Lucky" (U.S. #20) and "Change of Heart" (U.S. #21), and was to feature a track called "Keeping Me Alive", but producer Jimmy Iovine vetoed it from the album. Petty had expressed that he felt the album would have been more successful if "Keeping Me Alive" had been included. On the sixth album, Southern Accents (1985), the Heartbreakers picked up where they had left off. [clarification needed] The recording was not without problems; Petty became frustrated during the mixing process and broke his left hand when punching a wall. The album included the psychedelic-sounding hit single "Don't Come Around Here No More" (#13 U.S.), which was produced by and co-written with Dave Stewart. The video for the single, which starred Stewart, featured Petty dressed as the Mad Hatter, mocking and chasing Alice from the book Alice's Adventures in Wonderland, then cutting and eating her as if she were a cake. This caused minor controversy after it was criticized by feminist groups, but the video did win an MTV Video Music Award. Also in 1987, the group released Let Me Up (I've Had Enough), a studio album made to sound like a live recording, using a technique they borrowed from Dylan. It includes "Jammin' Me" (#18 U.S.), which Petty wrote with Dylan and Campbell. Dylan recorded a version of the Petty composition, "Got My Mind Made Up", on his album Knocked Out Loaded. In 1989, Petty released his debut solo album Full Moon Fever, which included five singles ("I Won't Back Down", "Runnin' Down a Dream", "Free Fallin'", "A Face in the Crowd" and "Yer So Bad"), and was accompanied by a tour with The Replacements. Two years later, the Heartbreakers released Into the Great Wide Open, produced by Jeff Lynne who had worked with Petty in Traveling Wilburys. Songs included the title track itself and "Learning to Fly". Multi-instrumentalist Scott Thurston joined the band as of the tour for the album. In 1994, Lynch left the band and was temporarily replaced by Dave Grohl before being permanently replaced by Steve Ferrone. Ferrone had worked with Petty, Campbell, Tench, and Epstein on Petty's solo album, Wildflowers. At this time, the band served as backing band on Unchained by Johnny Cash with producer Rick Rubin. In 1995, a six-CD box-set entitled Playback was released. Approximately half of the tracks were previously available on albums, and the rest were B-sides, demos and live tracks. Two notable tracks are a "solo" version of Tom's 1981 duet with Stevie Nicks, "Stop Draggin' My Heart Around", and the song "Waiting For Tonight", which features vocals from The Bangles. The latter song also appeared on the two-CD anthology released in 2000, Anthology: Through the Years. On April 28, 1999, Tom Petty & the Heartbreakers received a star on the Hollywood Walk of Fame for their contributions to the recording industry, located at 7018 Hollywood Boulevard. In 2002, the group released The Last DJ. Many of the tracks' lyrics contain stinging attacks on the music industry and major record companies. The album reached number 9 in the U.S. charts. Ron Blair played on two of the tracks. He also replaced the man who had previously been his replacement, Howie Epstein on the band's 2002 tour as a result of Epstein's deepening personal problems and drug abuse. Epstein died in 2003 at the age of 47. Tench described him as "the coolest guy in the band." Keyboardist Benmont Tench performs with the band at the Hollywood Bowl in 2010. In the band's thirtieth anniversary year, 2006, they headlined the fifth annual Bonnaroo Music and Arts Festival. In addition to Bonnaroo, Petty was on tour throughout the summer of 2006. The tour started in Charlotte, North Carolina on June 9 and ended in Randall's Island, Manhattan, New York on August 19. Stops included major cities such as New York, St. Louis, Indianapolis, and Denver. Supporting acts during the tour included Pearl Jam, The Allman Brothers Band, and Trey Anastasio. Additionally, Stevie Nicks joined the band onstage during the first eight concerts as well as subsequent second leg dates to perform various songs from the Heartbreakers' vast catalog. For the Highway Companion Tour they offered a Highway Companion's Club which allowed fans to receive priority seating, discounts at the Tom Petty Store, a complimentary CD of Highway Companion and a personalized email address. On September 21, 2006, Tom Petty and the Heartbreakers received the keys to the city of Gainesville, Florida, where he and his bandmates either lived or grew up. Petty quipped, when questioned about the key he received from Gainesville's mayor, "It's a lot nicer than the one we got in Chicago." In 2008, the Heartbreakers were also featured as the Super Bowl XLII Halftime Show. In April that year, the members of Petty's prior band, Mudcrutch, including Heartbreakers Petty, Benmont Tench and Mike Campbell, along with Randall Marsh and Tom Leadon, released a Mudcrutch album. In late 2008, Mudcrutch released a live EP. A collection of live recordings was released on November 23, 2009, and announced a new studio album, Mojo, for release in the Spring of 2010. The band released Hypnotic Eye on July 29, 2014, and archive recordings from their Playlist box set Nobody's Children and Through the Cracks digitally in 2015. In 2017, the band embarked on a 40th Anniversary Tour of the United States. The tour began on April 20 in Oklahoma City, Oklahoma and ended on September 25 with a performance at the Hollywood Bowl in Hollywood, California. The Hollywood Bowl concert, which would ultimately be the Heartbreakers' final show, ended with a performance of "American Girl". Early in the morning on October 2, 2017, Petty was found unconscious in his home, not breathing, and in full cardiac arrest. Following premature media reports of his death, Petty later died at the UCLA Medical Center in Santa Monica, California. He was 66. No official statement about the disbandment or the future of the Heartbreakers was made immediately following Petty's death. However, in his final interview with the Los Angeles Times a few days before his death, Petty expressed that the Heartbreakers would probably disband if one of its members died or became too ill to perform. In April 2018, Campbell, Tench and Ferrone acted as the backing band for the Light Up the Blues benefit concert in Los Angeles, backing Beck, Neil Young, Patti Smith, and Stephen Stills, with whom they performed Petty's "I Won't Back Down". That same month, it was announced that Campbell (along with Neil Finn) had joined Fleetwood Mac to replace their lead guitarist Lindsey Buckingham. In 1985, Tom Petty and the Heartbreakers participated in the world-spanning charity rock concert Live Aid. In 1986, Tom Petty and the Heartbreakers released a live record, Pack Up the Plantation: Live! In 1992, the band played three songs (including one backing Roger McGuinn) at Madison Square Garden to honor the 30th anniversary of the release of Bob Dylan's first record. The three songs were released on The 30th Anniversary Concert Celebration. They also played at the 2001 America: A Tribute to Heroes benefit concert. In 2002, the band played at Concert for George honoring George Harrison, who had died the previous year. In 2006, the band returned to their home town and celebrated their anniversary with a collection of popular songs. In 2012 Tom Petty and the Heartbreakers headlined Friday night at the Isle of Wight Festival. In 2017, the band headlined the final night of the British Summer Time festival in Hyde Park in London, supported by Stevie Nicks, who joined them on stage for a performance of "Stop Draggin' My Heart Around". On November 26, 2010, Tom Petty & the Heartbreakers released a special edition Record Store Day Black Friday 7" vinyl called Nowhere b/w Surrender for independent record stores. Petty released three critically acclaimed solo albums, the first of which was 1989's Full Moon Fever which included his signature tune, "Free Fallin'", as well as "I Won't Back Down", later covered by Johnny Cash, and "Runnin' Down a Dream" and Gene Clark's Byrds classic "I'll Feel a Whole Lot Better" - the album's only cover song. Though the Heartbreakers were dismayed by Petty's decision to go solo (similar to the arrangement between Bruce Springsteen and The E Street Band at the time), Campbell played guitar solos on every track, Tench contributed piano to one track, and Epstein reluctantly provided backing vocals to two tracks. Petty's second solo album, Wildflowers, included all Heartbreakers members except for Stan Lynch. The album, which featured Steve Ferrone on drums, produced the single "You Don't Know How It Feels". Petty's final solo album was Highway Companion which, like his first solo project Full Moon Fever, featured Jeff Lynne in the producer's seat. Campbell was the lead guitarist for the album, but no other Heartbreaker participated in the recording, as all instruments and vocals were performed by Petty, Campbell and Lynne. Petty fought against his record company on more than one occasion: first in 1979 over transference to another label, and then again in 1981 over the price of his record, which was (at that time) considered expensive. He was also outspoken on the current state of the music industry and modern radio stations, a topic that was a center concept of the lyrics of his 2002 album, The Last DJ, and its respective limited edition DVD. In an interview with Billboard magazine, Petty described himself as "not really [being] involved in the business side of music." ^ "Tom Petty & The Heartbreakers". AllMusic.com. Retrieved October 2, 2017. ^ "Tom Petty & The Heartbreakers (@tompettyofficial)". Retrieved October 3, 2017 – via Instagram. ^ a b Zanes, Warren (2005). Petty: The Biography Paperback. New York: Henry Holt. p. 105. ISBN 0805099689. ^ a b "Rock legend Tom Petty dies after suffering heart attack at home". Telegraph. October 3, 2017. ^ "Tom Petty & The Heartbreakers". Hollywood Walk of Fame. Retrieved September 16, 2016. ^ "Tom Petty gets key to Gainesville, Fla". USA Today. September 22, 2006. ^ McKnight, Connor (February 25, 2010). "Tom Petty and the Heartbreakers Announce New Album, Tour". Billboard. ^ a b "40th Anniversary Tour Announced!". TomPetty.com Official Website. Retrieved October 6, 2017. ^ "Music legend Tom Petty dies". CNN. October 3, 2017. ^ Lewis, Randy (October 2, 2017). "Tom Petty, Heartbreakers frontman who sang 'Breakdown,' 'Free Fallin'' and other hits, dies at 66". Los Angeles Times. Retrieved October 3, 2017. ^ Lewis, Randy (October 4, 2017). "Tom Petty's final interview: There was supposed to have been so much more". Los Angeles Times. Retrieved October 8, 2017. ^ "Heartbreakers perform for the first time since Tom Petty's death -- watch". Stereogum. April 22, 2018. Retrieved April 23, 2018. ^ Aswad, Jem (April 9, 2018). "Fleetwood Mac to Tour With Neil Finn, Mike Campbell as Lindsey Buckingham's Replacements". Variety. Retrieved July 11, 2018. ^ "May 23, 1979: Tom Petty defies his record label and files for bankruptcy". This Day In History. The History Channel. Retrieved March 21, 2011. ^ Petty, Tom & Zollo, Paul (2005). Conversations with Tom Petty. Omnibus Press. p. 72. ISBN 1-84449-815-8. ^ Erlewine, Stephen Thomas. "The Last DJ [Bonus DVD]". AllMusic. Retrieved October 9, 2017.